Commission a sculpture to enrich community, business, tourism, public or private spaces accessible to the public, or Partnership in a sculpture. Contact us and register to be a volunteer to assist the event – a variety of skills are needed. Emerging Sculptors program. A program to enable emerging sculptors to participate in the symposium as assistants. Family Day 13 April, children’s activities, Melba’s chocolate carving. Visit the Geological exhibit on the sculpture stone. Participate in the Sculptors @ Crystal Lake 2019 photo competition. Become a sponsor. You will be acknowledged online and elsewhere. Sculptors @Crystal Lake raffle assists in funding the event. Please email info@crystallakepark.com.au with your expression of interest or for further information, or contact the Chairperson on 041 983 8742 or Secretary on 045 983 8742. Reference details: Crystal Lake, your initial and surname. The 2015 photo competition winner was Peter Knights photo of Ben Tolhurst. 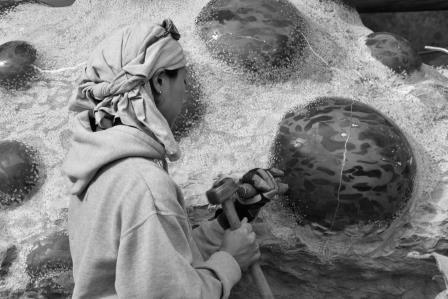 The Emerging Sculptors Program 2017 mentored artists who worked as assistants with the sculptors at the Symposium to enhance their stone sculpting skills. This program was supported by Country Arts SA and the Australian Government Regional Arts Fund. Sculptors @ Crystal Lake symposium is the initiative of a local ‘not for profit’ community organisation, the Macclesfield Community Association Inc. ABN: 26395848783 in partnership with the South Australian Stone Sculptors Association. It is funded by commissions of sculpture by private / corporate and community sponsors, by the sale of art work at the Crystal Lake Gallery, donations from the public, grants, fundraising activities, and by the generosity of participating sculptors. or contact the Chairperson on 041 983 8742 or Secretary on 045 983 8742.